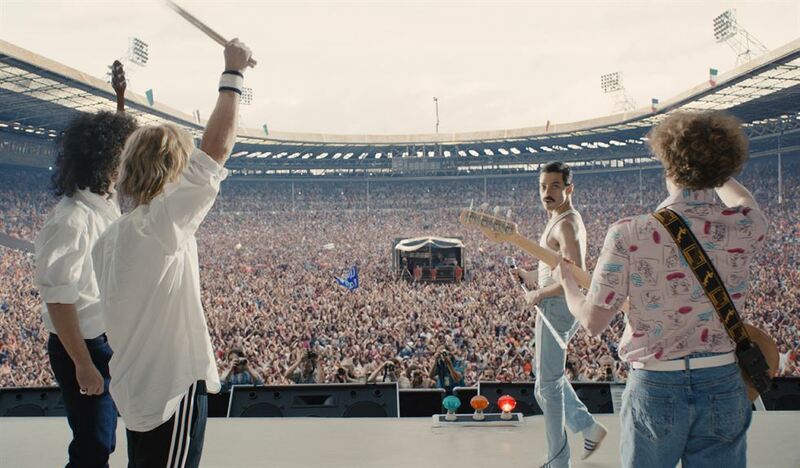 After audience members unabashedly sang along to Queen songs at Korean theaters screening "Bohemian Rhapsody," a major theater chain is stoking the rare music-cinema frenzy even further with a special memorial screening for Freddie Mercury. With only a few days to go before the anniversary of the legendary British rock band's lead vocalist Freddie Mercury's death, Megabox will hold the memorial screening on Nov. 24 to commemorate the day. "MX DOLBY ATMOS Memorial Screening" will show at eight theaters across the country. They include the shopping complex Starfield in Goyang and Hanam in Gyeonggi Province, and Seoul theaters in Mokdong, COEX and Sangam World Cup Stadium. Locations at Shinsegae Department Store in Daegu, Songdo Island in Incheon and Yeongtong-gu District in Suwon will also offer the special screening apart from the regular screenings. "Freddie Mercury, who had faced many problems but eventually overcame them to achieve musical stardom, evokes feelings of sympathy, heart-warming and reminiscence," a Megabox official told The Korea Times. "We hope this memorial screening becomes a special gift to those who miss him." Mercury, real name Farrokh Bulsara, died of AIDS in 1991 at 45. Megabox has put an urgent wanted ad on Facebook looking for fans who can sing along with the band in appropriate style. Those who think they have what it takes to become a "professional sing-alonger" can post their videos or photos on the social network. The contest is running from Nov. 16-21. The winning "sing-alongers" ― eight for each memorial screening theater ― will be announced on Nov. 22. The winners will each receive a VIP seat, where they will hopefully lead other audience members to sing along with 22 soundtracks including the hits "Somebody to Love," "We Will Rock You," "Don't Stop Me Now" and "Bohemian Rhapsody." Posters and photo cards for the film will be given to all audience members. Online bookings for the memorial screening open on Monday evening. "Bohemian Rhapsody" highlights the band's meteoric rise through its iconic songs as well as its crises as Mercury's lifestyle spun out of control, as well as its successful reunion on the eve of Live Aid, which became one of the most legendary performances in rock history. In Korea, the film had sold more than 3.13 million tickets in 19 days as of Monday, more than "La La Land" and "Begin Again," other musical films that were hits here, in the same period.